"I wanna reach out and grab ya"
One of my core complaints this season of The Flash has been its lack of interesting villains. The series is currently hyping Savitar as a Big Bad, but it’s been increasingly hard to see him as a credible threat given his goofy, CGI-generated look and lack of clear objective beyond “kill Iris because reasons.” It’s especially odd that The Flash would suffer for compelling antagonists as the character is considered to have one of the more illustrious Rogues Gallery in comics. A Flash foe who isn’t officially a member of the Rogues, but who’s fought the Scarlet Speedster numerous times over the years, is Abra Kadabra. So how does this longstanding character translate to the small screen? Not especially well, I’m sorry to say. For those unfamiliar with the character (and who didn’t read his Wikipedia entry above), Abra Kadabra is a magician from the far future who’s come to our century to become a supervillain. The justification for Kadabra’s ability to perform his incredible feats is Clarke’s Third Law that “any sufficiently advanced technology is indistinguishable from magic.” Theoretically, such a character would be nigh omnipotent but somehow he’s subdued on no less than two occasions by Team Flash (along with recurring guest star Gypsy). Go figure. Like many Flash villains of recent vintage, Kadabra’s powers aren’t especially well-thought-out so fight scenes end abruptly rather than through some clever solution devised by the heroes. And like his powers, Kadabra’s motivations are similarly murky. We know he wants to go back to his time, but how’d he end up in ours in the first place? What were his reasons for killing Gypsy’s partner and others in the course of his crime spree? Questions such as these go unresolved, despite the fact that Kadabra gets more screen time in this episode than most villains on The Flash have gotten this season. 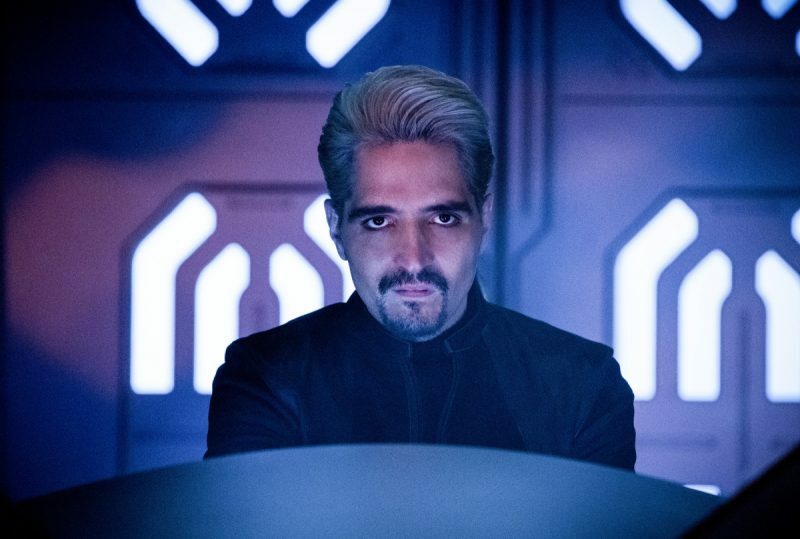 It’s too bad because David Dastmalchian’s performance as Kadabra hints at the sort of sly, sneering villain he could’ve been. Too bad the writers don’t give him anything interesting to say or do. About the only bit of intrigue Kadabra offers in this episode is his taunts that he knows Savitar’s true identity. Kadabra leverages this information in order to get Joe to release him from a STAR Labs holding cell. Of course, because he’s, y’know, a bad guy, Kadabra fails to keep his word and absconds with the blue orb doohickey he needs to power his time-travelling spaceship. And to top it all off, Kadabra fails to deliver on the big reveal, leaving the audience to wonder what the point of teasing us with it was in the first place. Even in this Kadabra-focused episode, Savitar remains an ongoing concern for Team Flash, which would be fine if he were a villain worth caring about. Clearly The Flash wants to leverage this mystery for all it’s got. Yet, despite the show’s insistence that he’s as baaaad as the other arch-speedsters that’ve appeared in the series, there’s no personal connection or glimpse into his motives that makes us understand and care about him when he does appear. The Savitar storyline has certainly made these characters act in strange and, well, uncharacteristic ways. Along with Joe stupidly letting Kadabra out of his cell, there was Barry once again demonstrating that his morality is shaky when under duress. Barry considers letting Kadabra out of his cell (that is, before Joe does it) in order to learn Savitar’s secret identity. And once again, there was Iris to talk him out of doing something stupid. For all the lip service the series pays to Barry being a good and upstanding guy, Iris seems to be the character’s conscience that keeps him from doing irreparable damage. Maybe she should have the speed powers instead? Even the solution Barry comes up with at the end of “Abra Kadabra” to save Iris sounds like it’s bound to fail, or at best have unintended consequences for the members of Team Flash. Barry reasons that villains like Kadabra and Savitar have been three steps ahead of him because they know the future and he doesn’t. Therefore, he decides to go back to the future in order to glean the data he’ll need to defeat Savitar. This plan doesn’t seem like a very good one given how Barry’s previous misadventures in the timeline have turned out (Exhibit A: Flashpoint). Granted, I’m not exactly sure how I would go about defeating a seemingly unbeatable speed god, but the solutions Barry has proposed this season (even if he didn’t end going through many with them) have left a lot to be desired. What’s more, these solutions repeat the same mistakes—a persistent problem for both the character and the series as a whole. Speaking of which, let’s talk about the Killer Frost problem. Throughout this season the writers have vacillated between mild-mannered Caitlin and her evil Killer Frost side; it’s almost as if the character has a switch that allows her to turn on one persona and turn off the other at will. When “Abra Kadabra” begins, the Caitlin side is “on” but she’s constantly concerned about the return of her dark side. So concerned, in fact, that when she is pierced by shrapnel during a Kadabra attack she won’t allow anyone to tear off the amulet that keeps her Killer Frost powers in check, even though those powers would allow her to regenerate from her wound. Instead, she stays conscious while talking Julian through her own surgery (which is pretty badass, I’ll admit). Julian successfully removes the shrapnel and all appears to be well post-surgery—that is, until Caitlin suffers a seizure and appears to be on death’s door. In desperation, Julian tears the amulet off Caitlin, thereby allowing her to recover but also transforming her into Killer Frost. So this confirms one of the headlines Barry saw in the future about a Killer Frost attack. 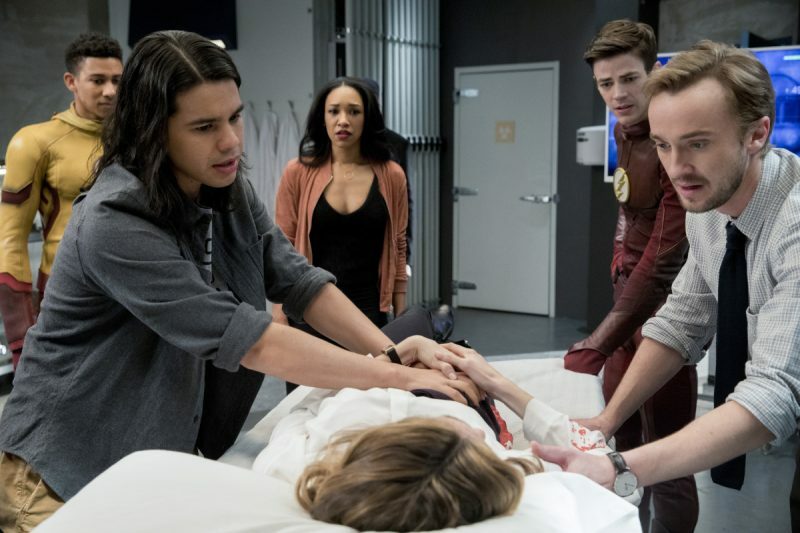 Presumably, subsequent episodes will involve Team Flash trying to save Caitlin from her Killer Frost. That sounds interesting, don’t believe we’ve seen that plot before...oh wait, we have, in the seventh episode of this season, entitled “Killer Frost.” And, to be frank, I didn’t care for it the first time either. In the case of The Flash, the axiom “the more things change, the more they stay the same” couldn’t be more depressingly true.